In stock - low quantity. Order in the next 7 hours, 45 minutes and it will go out today! 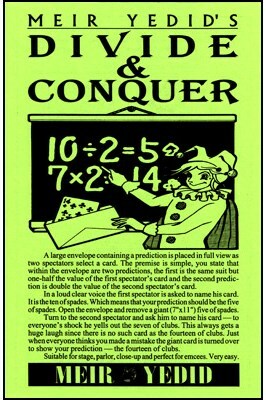 A large envelope containing a prediction is placed in full view as two spectators select a card. The premise is simple, you state that within the envelope are two predictions, the first is the same suit but one-half the value of the second spectator`s card.In a loud clear voice the first spectator is asked to name is card. It is the ten of spades. Which means that your prediction should be the five of spades. Open the envelope and remove a giant (7"x11") five of spades. The magician turns to the second spectator and asks him to name his card. To everyone`s shock he yells out the seven of clubs. This always gets a huge laugh since there is no such card as the fourteen of clubs. Just when everyone thinks you made a mistake the giant card is turned over to show your prediction - the fourteen of clubs!